My dad took me to the Campbell County Animal Shelter and told them that he had found me a month earlier and he was unable to find my owners. But the shelter workers knew he was lying, so they contacted my Vet and found out he had me since I was 6 weeks old. I was a really good boy so I couldn't figure out why he dumped me. The shelter called HHGDR to come and get me and they did right away. I unfortunately am just a plain black with white markings and there were so many of us at HHGDR, that no one hardly ever looked at me. Then one day after being there 16 months a really nice woman stopped in and told Grandma Dale she wanted a special Dane that would fit in with her 2 female Danes she has at home. 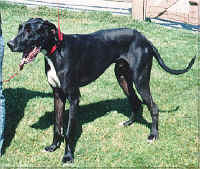 Grandma Dale told her she had just the right Dane for her, she hurried out to get me. Well my new mommy agreed, and now I have a GREAT family, my new daddy thinks I am really big and handsome. I'm the son he always wanted, they renamed me Becker, I think that is much nicer then my old name.